George Rodrigue entered two art contests in his life and failed at both. By ‘failed,’ I'm not talking about the fact that he lost, but more significant that he was disqualified or learned a hard lesson about cheating. “Nothing in life is fair,” my mother used to say. And maybe she was right. But in the end perhaps that's not a bad thing. In George’s case his contest experiences taught him life lessons; they helped him understand people and, most important, that no one reaches their star by proxy. Either you work hard and make it on your own, or it doesn’t happen. The first contest George entered was in 1954 at the Sears Roebuck Catalogue Store in New Iberia, Louisiana. In those days, according to George, the Sears store was nothing more than a small room with a row of catalogues and a woman behind the desk. To shop at Sears, one visited the so-called store, chose their items from a catalogue, and placed their order accordingly. There was no merchandise on hand, no fitting room, and nothing relating to the department stores of today. For some time, in an effort to widen its reputation beyond automobile tires, Sears hired actor Vincent Price as their cultural ambassador. He traveled across the country with art exhibitions for the store. In fact, it was one of these shows (in Baton Rouge) that first exposed George a few years later to paintings by professional artists. (Remember, there were no museums or galleries in southwest Louisiana in those days). In keeping with this direction, the New Iberia store, too small for an exhibition, held an art contest for local grade school students. They produced a coloring sheet so that each child worked on the same image. At age nine, recently recovered from polio, young George wanted nothing more than to win the child’s tool set offered as a prize. As described in the recent post “The Ghost of Christmas Past,” his mother was not fond of gifts, and if he didn’t win it, he knew he would never have one. From an early age, if George wanted something beyond necessities such as food and clothing, it was up to him to buy it. By the time he was a teenager he earned money by working in his father’s tomb business and by selling his paintings of swamp monsters. He also took the occasional portrait commission, until the director of the local funeral home refused to pay him the agreed-upon price of fifty dollars (below, a hard lesson learned). He didn’t win the tool set. Rather, the boy who sat behind him in the third grade and who “couldn’t color at all” took it home. His aunt, the manager at the Sears Roebuck Catalogue Store, presented him with the prize. 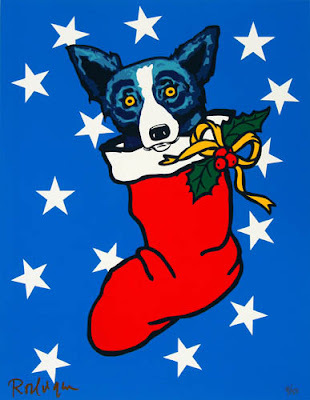 Ten years later, now in his early twenties, George Rodrigue entered his second and final art contest. 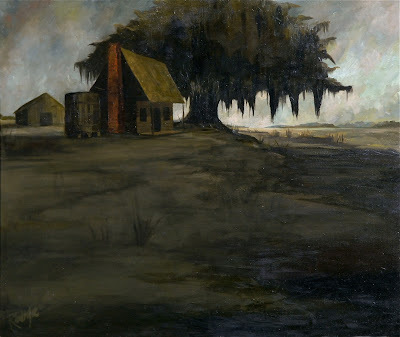 It was in Morgan City, Louisiana, and he was disqualified from the start because the contest’s organizers thought he passed off antique landscape paintings as his own. (For more on this story visit here). It’s ironic, given this track record, that George launched last year his own art contest for high school seniors through the George Rodrigue Foundation of the Arts. 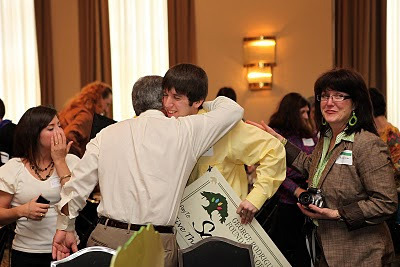 With sixteen winners and $35,000 in scholarship awards, the contest was an enormous success, as rewarding for George, I believe, as for the winners. Remembering the rigged Sears contest, he avoids judging himself, ensuring fairness as much as possible with guest judges and nameless entries. Remembering his own academic struggles, he eschews G.P.A. requirements, test scores, and declared majors, hoping all juniors and seniors in Louisiana, regardless of their grades, will find confidence in their creative abilities and give this competition a try. Launched a few weeks ago, this year’s contest offers more than $40,000 in scholarship prizes and includes cash awards for high school juniors. 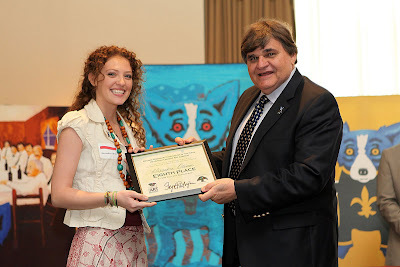 In some cases schools provide matching scholarships, as in the case of Alexandra Olivier of Gretna, Louisiana (pictured below with George Rodrigue), who attends Savannah College of Art and Design. Her $1500 GRFA scholarship quickly turned to $7500, as SCAD matched the award for four years. George visits with these winners at a luncheon in their honor and follows their progress during the year, hosting an art show of their works within his Royal Street Gallery. The exhibition travels to several venues throughout the state, including the Louisiana Governor’s Mansion in Baton Rouge, the Old Courthouse Museum in Natchitoches, and the Louisiana State Exhibit Museum in Shreveport. 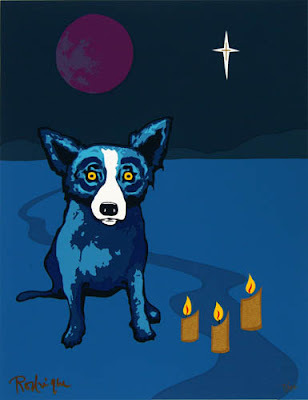 For more information on the George Rodrigue Foundation of the Arts 2011 Art Contest visit GRFA’s fabulous new interactive website: www.georgerodriguefoundation.org. 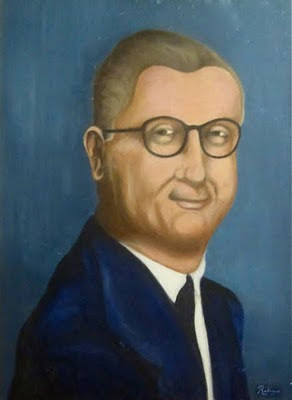 For related posts visit “The Creative Competition in Two Parts” and "Catholic High, Brother Edward, and the Art Scholarship"
I hope to see you for my weekly posts at Gambit's Blog of New Orleans, linked here- Thanks for reading! George teaches a lesson to all of us and you have shared it eloquently. I love reading your blogs.